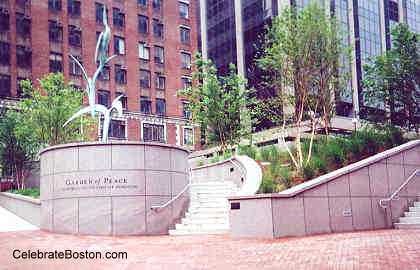 Near Government Center, and a few blocks away from the Freedom Trail, is the Garden of Peace Memorial. The Garden of Peace honors the memory of victims of homicide, and is a reminder about the impact of violence in our society. The central design of the garden is that of a dry stream bed. At the top of the stream is a large dark granite orb. The orb symbolizes the enormous sadness, weight, and tragedy of homicide. The stones in the river bed are each unique, and represent one victim of homicide. A name is inscribed on the individual stones in memory of a person that had lost their life. At the bottom of the dry stream rises a statue of an ascending ibis bird, symbolizing hope. The Garden is a place beyond the boundaries of individual lives and neighborhoods where those who have not been directly victimized by homicide can express their sympathies and also support those whose lives have been inalterably changed by such violence. 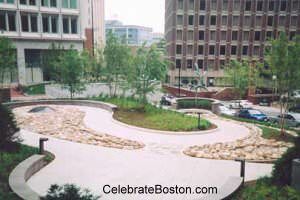 Each stone honors the memory of a victim and represents huge sorrow and great personal tragedy. Victims include babies, children, parents, siblings, a president, and a senator. Represented are victims of terrorists, guns, knives, and spouses. Some people, such as Molly Ann Bish and Jeffrey Curley, are familiar due to the publicity surrounding their abductions and murders. While most stories never make the headlines, all are lovingly remembered by family and friends. Let us never forget the victims of homicide.